Easter joy has been harder to come by this year. 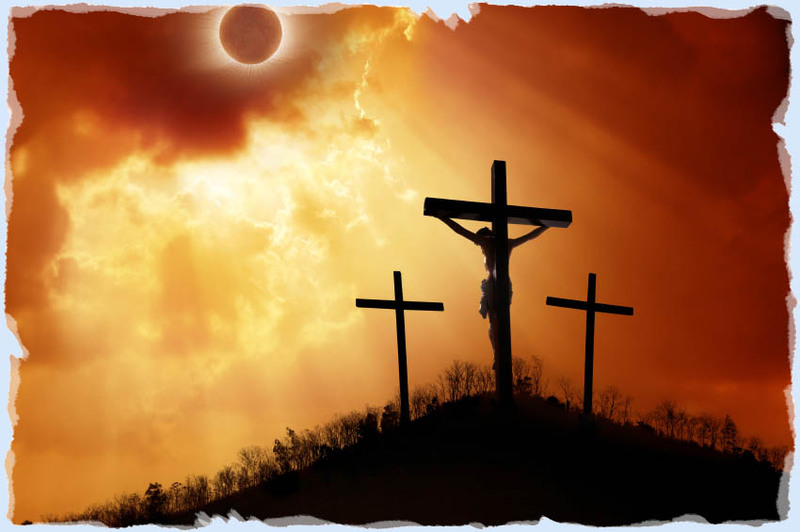 Between the growing ugliness of American politics and the acrimony within the church body, I’ve found it harder to anticipate looking up from the broken body of my Lord to rejoice this Sunday in the resurrected and ascended Christ. When I shared my struggle with a good friend, he suggested I revisit a collection of sermons that the 19th-century priest John Henry Newman preached in Oxford in response to the challenges of his own day. After turning to Newman, I found a surprising insight: In his view, my tempered joy is not merely acceptable or tolerable but rather called for as a deeply Christian response to Easter. In a sermon titled “Keeping Fast and Festival,” Newman begins with a comparison of Christmas and Easter. At Christmas, he says, we rejoice with the “natural, unmixed joy of children.” Easter joy, however, is not the same. This joy is experienced as “a last feeling and not a first.” It grows out of tribulation, as Paul writes in Romans 5, emerges from the harvest (Isa. 9:3), and comes after (and out of) Lent and Good Friday. In other words, if living through Lent teaches us even a little about how Christ bears the world’s suffering, then our Easter enthusiasm should look different from our response to God’s arrival as a baby at Christmas. It should feel more seasoned, more aged, and more worn. Easter joy isn’t the joy of children, says Newman, but rather of convalescents who have received the promise of healing, who are starting to get well but still regaining our strength after a Lenten season of confronting our weakness and sorrowing over our sin. Newman’s image of Christians as convalescents brings to mind the story of healing at the end of The Magician’s Nephew by C. S. Lewis. At the culmination of the book, Diggory, the young hero, watches Aslan plant a magic apple in the newly created Narnian soil. A tree immediately grows from it. In Narnia, the apples have immense power of healing and strengthening. Aslan then gives Diggory a fruit from the tree and sends him back to our world to help heal his sick mother. However, worrying about my own lack of “appropriate” emotion is not the solution and, in fact, may be part of the problem. When I refuse to let go of disappointment with my own brokenness and that of the world, I fail to recognize not only “the languor and oppression of our old selves” that persists this side of heaven but also the reality of the new life given to me. The solution is not to emote more or blot out the sorrows of this world but rather to turn in prayer, not inward, but upward. Easter joy does not require us, then, to leave this present hour behind or to be unbruised by the events of this world. Instead, it comes when, like Diggory, we return to the brokenness around us (including our own brokenness) with the comfort of Christ’s presence and the instruments of grace that he provides for us throughout the paschal season. In this act of return, joy comes wearing a different, darker guise, but it also appears deeper, better, and more miraculous than anything we could ever expect. Elisabeth Rain Kincaid is an assistant professor of moral theology at the Aquinas Institute of Theology. Her research focuses on questions of moral formation, the development of virtue, and the intersection of law, business, and theology. A different version of this piece originally appeared at Covenant, the weblog of The Living Church magazine. VIDEO What happens when ‘Rule of Law’ doesn’t include God? William Brewster is portrayed in the Rotunda of the U.S. Capitol giving thanks to God in the “Frieze of American History” depiction of “The Landing of the Pilgrims.” He is depicted as representing “religion” in a thematic painting located in the president’s room of the Senate Wing. William Brewster was an elder in the Pilgrims’ church in England. He was arrested and jailed by Britain’s oppressive government which denied liberty of conscience and religious freedom. Brewster fled with the Pilgrims to Holland, and 12 years later, sailed with them to America. He signed the Mayflower Compact. 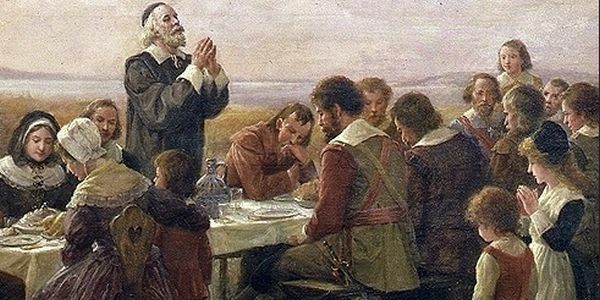 William Brewster is portrayed in the U.S. Capitol Rotunda holding an open Bible in the painting “The Embarkation of the Pilgrims.” In that same painting, the Pilgrims’ Pastor, John Robinson, is portrayed kneeling with his hands extended in prayer. Pastor John Robinson is considered one of the founders of the “Congregational” Church. The words “congregational,” “compact” and “commonwealth” refer to a group of people in “communion” or “covenant” with each other. This was a concept studied by the Reformation scholars, such as John Calvin, Huldrych Zwingli, Thomas Cromwell, John Knox, the Scottish Covenanters and the translators of the Geneva Bible. “Ekklesia” means a called-out assembly; a gathering of citizens called out from their homes, congregating in some public place; an assembly of the people convened at the public place of the council for the purpose of deliberating; assembly of the Israelites. King James insisted that in his translation of the Bible, the word “ekklesia” be translated “church” rather than “congregation” or “assembly,” as he wanted to be its head, and how can one be the head if it is the congregation which deliberates? Ten years after the Pilgrims arrived in America, Puritans fled persecutions in England and began arriving in New England in 1630. In the next 16 years, called the Puritan Great Migration, nearly 20,000 Puritans settled in Massachusetts, being led by John Winthrop. “Covenant” theology was held by many New England colonial leaders. The Puritans that stayed back in England had a civil war, led by Lord Protector Oliver Cromwell, and afterwards established a covenant form of government in 1649, called “Commonwealth.” It only lasted a decade, ending when King Charles II was restored to English throne. To the Protestant Reformers of the 16th century, the perfect example of a nation with a “covenant” form of government was ancient Israel – a group of people in agreement with each other, getting their rights from God and being individually accountable to God. In the 17th century, during the Age of Enlightenment, the idea of “covenant” evolved into “social contract” – a group of people in agreement with each other, with or without God. In the 18th century, the French Revolution morphed “social contract” into intentionally excluding God. Rights came from the group and individuals are accountable to the group. This culminated in the French Revolution’s bloody Reign of Terror, 1789–1794, beheading those who resisted the group or state. To remedy this, the United Nations had to appeal to a “higher law,” which to them was a set of rules agreed upon by “all the nations” of the world. The naiveté of this effort was revealed when a U.N. subgroup of 57 Muslim countries formed the OIC –Organization of Islamic Cooperation. On June 30, 2000, the OIC rejected the U.N. Declaration of Human Rights and embraced their own “superior” Cairo Declaration on Human Rights in Islam, which allowed for beating of women and killing of apostates. 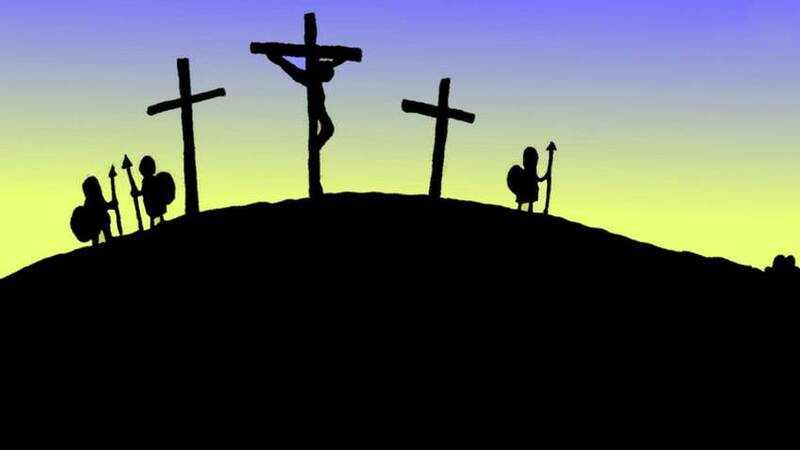 Author Narrow Path MinistriesPosted on April 20, 2019 April 20, 2019 Tags Bible, Christian, Christian Thinking, Cross, Founding Fathers, Jesus Christ, Morality, New Testament, Obedience, PilgrimsLeave a comment on VIDEO What happens when ‘Rule of Law’ doesn’t include God? That attack on truth has been considered fiction, but distorting history is a fact that is accelerating daily. Ashamed of the past and fearful of the future, desperate, duplicitous, and disgusting politicians have destroyed the historical record to make them look less unscrupulous and to confuse, corrupt, and control each generation. A rewrite of history is in the making as I write. It has happened and has been accelerating since the beginning of time. Ancient kings glorified their successes in battle, often neglecting major disasters, all to preserve their position in history. They profusely bragged about their elaborate building programs but refused to reveal their warring tendencies that destroyed their cities. Sennacherib was the son of Sargon and ruler of the Assyrian Empire in the eighth century B.C. Assyrian inscriptions reveal that Sennacherib made astoundingly vainglorious boasts about his accomplishments of shutting up Hezekiah in his Jerusalem capital “as a bird in a cage.” Everyone now realizes that Sennacherib took 46 Jewish cities but failed to conquer Jerusalem (after the angel of the Lord killed 185,000 of his troops in one night), and Sennacherib left in defeat for his Nineveh palace only to be eventually killed by his son. If anyone offended a tyrannical king, not only was that individual killed, but often any mention of him was removed from all public records. I revealed in my book, The God Haters, an example of politicians manipulating history when Caesar tried to obliterate the memory of Pilate because he had offended Caesar. Pilate therefore did not exist since Caesar said so, and officials and historians willingly obeyed by removing Pilate’s name from all records. For many years, Bible critics declared that the Bible is unreliable because Pilate could not be found in any historical record. Then archeologists, digging in the rubble of Caesarea by the Sea, found a five-inch-thick stone that referred to Pilate and had been used in the famous theater ruins where I have preached a few times. The stone had been used because it was exactly the size needed and was used with the forbidden information about Pilate underneath! It is on display in Caesarea today. Roman Emperor Caracalla murdered his brother and co-emperor Geta and had statues of Geta removed and his image chiseled off coins. Geta’s image was removed from all paintings, his statues were destroyed, his name was struck from all records, and it became a capital offense to speak or write Geta’s name. An estimated 20,000 people were massacred as a result. Soviet despot Joseph Stalin sent Leon Trotsky into exile and airbrushed him out of the Great Soviet Encyclopedia and then, to finish the matter, had him assassinated in Mexico. For decades, when a Soviet official fell out of favor with the sitting tyrant, the offender was painted out of the official photos of the most recent May Day Parade in Moscow. Politicians never change, and modern politicians continue in the same way: they exaggerate their successes, excuse their shortcomings, and excise their sins. Similarly today, politicians and their zealot followers seek to rewrite history and remove any photos or statues that might not meet their modern views of morality. Some U.S. textbooks don’t deal with major American founders, and liberal censors insist that Huckleberry Finn be removed from libraries because it is politically incorrect. Notre Dame is a Catholic university, and the president cowardly responded to student complaints about paintings of Christopher Columbus, so they are being concealed. Columbus was a dedicated Catholic, now repudiated by a Catholic university. Usually, at the first demand of self-appointed protesters, whimpering university presidents cower under their desk as they immediately capitulate to the foaming-at-the-mouth fanatics. Officials at the University of Pennsylvania have quickly surrendered without a fight to the fanatics by removing a portrait of William Shakespeare and replacing it with a black lesbian writer. New York governor Andrew Cuomo removed the statues of Robert E. Lee and Stonewall Jackson from a public place. Calhoun College has been changed to Grace Hopper College since Calhoun was pro-slavery, you know. Also, stained glass windows depicting slavery were removed from college buildings. New Orleans removed its famous 20-foot statue of Robert E. Lee, the last of four to be removed. Baltimore removed its offensive statues overnight including one of Supreme Court justice Roger B. Taney, author of the majority opinion in the Dred Scottcase that decided that former slaves could not become U.S. citizens. In rewriting history, they are going after dead judges for their judicial decisions. It is going to get confusing (and expensive) when the fanatics start removing and changing all streets, buildings, etc. with the names of slave-holders George Washington and Thomas Jefferson and almost all the signers of the Declaration of Independence. Even Mount Rushmore is in the sights of the history-haters, since two of the four faces were racists — Washington and Jefferson — and Theodore Roosevelt an imperialist. Only Lincoln is safe, and if his statements on blacks were well known, he would be in danger. Roosevelt is considered an imperialist and is often ridiculed rather than respected for his part in the Spanish-American War. Roosevelt’s statue in front of the museum on Central Park West is a tribute to his status as the nation’s greatest environmentalist. His statue is also in front of the Museum of Natural History. Will the zealots determine to destroy Rushmore? Dr. Don Boys is a former member of the Indiana House of Representatives, who ran a large Christian school in Indianapolis and wrote columns for USA Today for eight years. Boys’s book, Muslim Invasion: The Fuse is Burning! is available here. Follow Dr. Boys on Facebook at Don Boys, Ph.D.and TheGodHaters, Twitter, and visit his blog. Author Narrow Path MinistriesPosted on April 20, 2019 Tags distort, Dr Don Boys, George Orwell, learn from history, not defile, or destroy it., Supreme Court justice Roger B. TaneyLeave a comment on Politicians, Fearful and Ashamed of Truth, Rewrite History! COLORADO SPRINGS: Paris’s Notre Dame Cathedral, built in the 17th century, burned this week. Even before its embers were out, reporters re-telling the historic event. And they are emphasizing a benign explanation for one of the world’s most destructive fires. However, It matters whether the fire was set by terrorists or by a careless restorer. Moreover, nefarious explanations of the fire are already being blacked out. Those in charge seemingly are sending a message that when an iconic symbol of Western Civilization burns, we are to remain silent. We must not speak of it. We must not knit together facts. There’s nothing to see here, folks. Just move along. And many comply. We remain silent lest we are accused of harboring mad conspiracy theories. In America, it is a time of hurt feelings, “fairness,” and political correctness superseding free speech. When facts are unpleasant, they must be dispatched. Feelings win out, curiosity remains unsatisfied. And this week, as an iconic symbol of Western Civilization is destroyed, we are to remain silent. And yet, there are certain pesky facts underlying the Notre Dame tragedy. One must ask, do they not know why, or are they simply refusing to know why. Are they turning a blind eye to the destruction? Are they ignoring undesirable information? Churches and cathedrals are living, standing evidence of the rise of European civilization, with its roots embodied in Roman Catholicism and Christianity. These religious structures are repositories not only of religious observances, but also of history, culture, art, architecture, and music. Notre-Dame de Paris, “Our Lady of Paris,” dates from 1160, when construction began, and its completion in 1260. A medieval cathedral, Notre Dame sits on the Ile de la Cite in Paris’s 4th arrondissement neighborhood. It is one of the finest examples of French Gothic architecture. Its innovative use of the rib vault and flying buttress, it’s enormous and colorful rose windows, and the naturalism and abundance of the sculptural decoration set it apart from the earlier Romanesque style. The cathedral was desecrated in the 1790s during the French Revolution when its religious imagery was damaged or destroyed. In 1804, the cathedral was the site of the Coronation of Napoleon I, as Emperor of France. Notre Dame witnessed the baptism of Henri, Count of Chambord in 1921. As well as the funerals of several presidents of the Third French Republic. Moreover, to those who would look the other way, who willfully refuse to observe evil, much less do something about it, there should be no quarter. To “See no evil, hear no evil, and speak no evil,” is to succumb to it. History has taught us many lessons, the most salient of which is that to remain silent in the face of evil is to cede to it an undeserved power.Let Notre Dame stand as a reminder to all. If you see something, say something. Preserve civilized culture. Do not desecrate artifacts of those who came before. Civilization is built upon these forebearers. We must honor them. We must look to them for guidance. The latest speculation by French officials is that the fire that gutted the Notre Dame Cathedral was caused by the electric wiring in an elevator shaft, but it is not definitive as of yet. One thing the officials are sure of, that the fire had nothing to do with arson or terrorism. Despite that it was none of their doing, the sick nutbags at ISIS are celebrating the near destruction of one of the most famous houses of worship in the world, just days before Christians celebrate their Easter holiday. 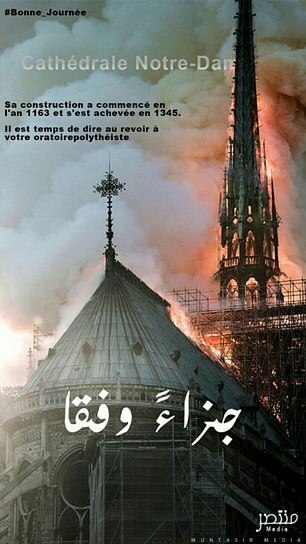 A poster of the blazing cathedral appeared online accompanied by the words, ‘Have a good day,’ and was created by the ISIS-affiliated Al-Muntasir group according to the Terrorism Research & Analysis Consortium. ISIS fanatics are heartlessly reveling in the inferno at Notre Dame Cathedral just days before Easter calling it ‘retribution and punishment’, according to terror intelligence researchers. It didn’t take long for those murderous animals to rejoice in the pain of others. The only surprise is that they didn’t claim to have started the blaze, After-all along with killing, lying is used for ISIS propaganda. There are those who speculate the fire was an act of terror. Perhaps because many churches in France were attacked recently and a woman was just sentenced for plotting an attack near Notre Dame Cathedral. Some point to the fact that the roof of the cathedral burned so fast. But they forget that wood is flammable and 800-year-old wood is even more combustible. Besides authorities on the scene said ruled out arson and possible terror-related motives as possible causes at least for the moment and are treating the blaze as an accident, according to The Associated Press. Any speculation that the fire was premeditated and purposeful is dangerous and irresponsible. I mourn for the cathedral and the people of France; I do not cry because I am a Catholic or a Christian, but because I am an observant Jew. As a person of faith, I believe that any place where people of any religion that observe the seven Noahide Laws* gather to connect with God is a holy sanctuary and must be treated as thus. Don’t commit adultery or sexual immorality. Don’t eat flesh torn from a living animal. Any Gentile who observes the laws above is considered a righteous gentile. Cross-posted with The Lid. Alicia Luke contributed to this report. (Newswars) – A former chief architect and general inspector of French historical monuments has cast doubts on the official narrative that the Notre Dame fire was likely an electrical short that set the iconic cathedral ablaze. “So, you’re telling us that this type of timber doesn’t burn like that?” Mouton was asked by an LCI host. Asked to present an explanation for how the blaze spread so quickly and with such strength, Mouton asserted that there were no additional precautions that could have been taken to ensure such a “quick” incineration could be prevented. Below: Alex Jones presents video of Fox host Lou Dobbs warning his viewers of a “political” cover-up of the cause of the Notre Dame cathedral fire.